Deck Expressions is a leading provider of deck building materials online and we are thrilled to offer home and business owners a huge selection of RDI products. RDI has long been at the forefront of the DIY deck building movement, and the combination of quality, value, safety, and simplicity of their deck railing goes nearly unrivaled in the industry. Today, we would like to take some time to get in-depth about the RDI company, their products, and why people trust RDI to create the best deck railing systems. Keep reading to learn more about RDI! Railing Dynamics, Inc., more commonly referred to as RDI or RDI Railing has been a favorite choice of stair, deck, and patio railing for home and business owners alike since their first vinyl rail system was released in 1989. The history of RDI is not unlike most successful business adventures. Entrepreneurs saw a need in the market for safe, durable, and easy-to-assemble railing that the average homeowner could install themselves. Rather than needing to hire a contractor to build a custom rail system, RDI makes every homeowner a DIY-er with easy-to-follow instructions and a product that exceeds safety standards left and right. RDI’s cornerstone product, the Endurance Original Rail System, was a revolutionary railing system. While it looked and functioned similarly to other deck and patio rails, it came in a boxed kit with simple instructions. With pre-installed railing fasteners, the entire rail can be assembled just by snapping a few pieces into place. This new system of railing sparked a demand for more options. RDI came out with new options for deck posts, deck post sleeves, and more handrail options to make ADA-compliant decks. 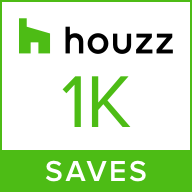 They also began offering decorative post caps and bracket options to help homeowners customize their railing. But homeowners still wanted more. This demand was the push RDI needed to vastly expand their line of durable railing to include new styles, materials, and customizable options — all while remaining true to their original mission of providing durable, safe, and easy-to-install deck railing. In 2008, RDI introduced the Titan Pro Rail. This RDI vinyl railing system was low-maintenance, ADA-compliant, and incredibly economical, making it a top-choice of railing for business-owners as well as homeowners. 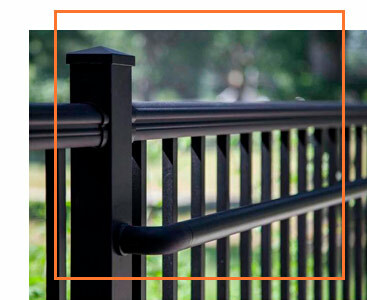 This metal railing, which Deck Expressions offers online, is clad in vinyl for added resistance to weathering and features metal-to-metal connectors to ensure stability. The cast aluminum brackets are already installed in the correct space, so installation is about as easy as it gets. Because of the design of the top rail, the Titan Pro RDI Railing system fits the requirements for the International Residential Code for stair railings, meaning there is no need for a second handrail when using this system for stairs. But RDI didn't stop there. In 2011, they also developed a steel railing system called Excalibur. The RDI Excalibur Railing met the demand for more metal railing options from the brand. This system combined hidden attachments, pre-attached brackets, easy installation, and a classic design. With several finish options, homeowners could choose the style and design that best suited their home exterior without paying the price for a custom rail. In 2013, after being acquired by Barrette Outdoor Living, RDI created yet another material option for their rail system. They introduced RDI Transform Railing, a rail system made of Resalite®, a water-resistant, resin-based core that looks and feels like wood without actually containing wood. This gave yet another option for those looking to find deck railing that perfectly matched their style without the high-price tag and upkeep that a traditional wood railing system would require. RDI still uses these four main materials for their railing systems — vinyl, aluminum, steel, and Resalite — which gives home and business owners plenty of options when it comes to the style of their railing systems. Below, we are going to get into more specifics about each of these railing materials and offer some maintenance and installation tips along the way. Keep reading to learn more! We will start with the RDI railing material that put the brand on the map. Vinyl is a widely used material seen everywhere from clothing to music records to siding for homes. Vinyl is a type of plastic or synthetic resin made up mostly of polyvinyl chloride (PVC). The main reason why vinyl is one of the best materials for deck railing is because it is resistant to moisture and humidity unlike wood or metal decking. This durability ensures that vinyl railing will withstand the test of time, often lasting upwards of 30 years when properly cared for — which is saying something considering this type of railing is incredibly low-maintenance! And while nearly all materials expand and contract with temperature changes, RDI rails are built with this in mind and should not be affected by extreme weather conditions. Even though this is a synthetic, man-made material, in comparison to other decking materials it uses little natural resources, is recyclable, and relatively easy to produce. Unlike other plastics, the vinyl used in RDI vinyl railing systems (including RDI Endurance, and RDI Titan Pro) will not yellow overtime. Most often, plastic yellowing is a result of the plastic polymers absorbing UV radiation. This can cause it to not only turn yellow, but to become brittle and crack more easily. To combat this, the vinyl that RDI uses contains UV inhibitors (titanium dioxide) that prevents ultraviolet degradation. To maintain your vinyl RDI railing, a simple hose-down every six months or so will be sufficient. For more stubborn cleaning issues, use a non-abrasive cleaner and water solution and scrub with a rag or Magic Eraser. While RDI takes pride in providing customizable railing systems, it is important to remember that painting your vinyl railing is not recommended and will actually void RDI’s warranty. However, some of their other railing products are fine to paint and will not void the warranty (we’ll talk about that later). Above, we briefly mentioned RDI’s Resalite railing systems. Resalite is an innovative resin-based material that looks and feels like real wood. However, with no wood in the product, this rail is resistant to rot, sagging, moisture absorption, discoloration, and all the other downsides that wood railing brings along. This system has an acrylic finish on the cap to ensure maximum durability and long-lasting beauty. Unlike the vinyl railing, the acrylic capstock is a good candidate for painting if you decide to go that route. Because the acrylic capstock has no plasticizers or additives like the vinyl railing does, it can be painted without affecting the durability of the paint. However, be sure to chat with your chosen paint provider to ensure that paint you are using will last. For example, typical house paints and water-based paints do not adhere well to acrylic capstocks. Resalite is the material of choice for the RDI Transform Rail System. The standard kit for this faux-wood rail option comes with white square deck balusters, however, there are lots of ways to customize this unique rail. 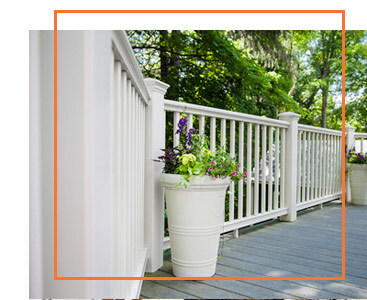 One of the most popular Transform Rail modifications is with a deck cable railing infill as opposed to traditional deck balusters. Other than using glass balusters (like those made popular by the Deckorators brand), cable railing for decks allows for the most visibility possible and looks sleek and modern. You can get a better idea about how to DIY your own cable deck railing from RDI here. Keep in mind that installing cable railing will take a little more work than using RDI’s typical snap-in installation methods, but with a little patience and the right tools, many homeowners will be able to accomplish this task over the weekend. And trust us, the results are well-worth the effort! RDI’s Avalon Aluminum Railing is from the RDI Railing Metal Works line of deck and patio railing. They also offer the Titan Pro Rail which is a hybrid between vinyl and metal railing. The Titan Pro is stabilized with metal-to-metal connectors and features vinyl-clad aluminum handrails. However, if you are going for a classic metal look, then the Avalon Rail System is the one to go with as far as aluminum railing goes. For easy installation, we offer a pre-assembled aluminum rail by RDI with three color options. Just choose your preferred top-rail option and deck posts and you’re all set! This kit comes with matching aluminum balusters, but Deck Expressions also offers an option for a sleek deck with glass balusters. Avalon Aluminum Railing is available for use with tempered glass balusters. These offer an unobstructed view and a modern, minimalist design. If this is the route you’re going, be sure to get the correct aluminum railing system for your glass balusters! You’ll want to get the Avalon glass deck railing system that has glass slat gaskets that allow the glass panels to fit snugly into the rail without additional connectors. You can learn more about installing RDI glass balusters here! Another product from the Metal Works line by RDI Railing is the Excalibur Steel Deck Railing. This system offers easy-installation like most RDI products, exceeds safety standards, and is incredibly sturdy thanks to metal-to-metal connectors. In fact, RDI describes the Excalibur line with the following sentiment: “We’ve taken elements you’ve loved from our other systems – Endurance-like hidden attachments, Titan-like easy installation with pre-attached brackets – and created a railing line that is sturdy and tough, yet easy to install.” We think that sums it up pretty darn well! This steel deck rail system is the perfect mix-and-match of the favorite features from their other products. Because of the clean design of this RDI railing, Excalibur looks as good indoors as it does outdoors and goes as well with a modern home as it does a log cabin. The possibilities of where to place this rail are endless and RDI offers additional customizable features to give you the exact look you want. They also make it easy to use this railing for stairs with adjustable metal stair brackets, as well as optional metal railing gates that fit this style. Keep in mind that this steel railing system is finished with a powder-coat for extra durability and rust resistance. This means if you end up cutting your railing, you will want to finish those edges with another rust-resistant, zinc-rich primer or paint. RDI Recommends Rust-Oleum® in Satin Canyon Black for the black finish and Rust-Oleum in Hammered Brown for the bronze finish. These paints can also be used for touch-ups. To help consolidate the information above, we've created this helpful infographic outlining the differences and similarities between these four railing materials. RDI Railing has long been the rail-of-choice for homes and commercial buildings alike. With plenty of materials and colors to choose from, as well as a plethora of additional pieces to customize your rail, the possibilities are endless. 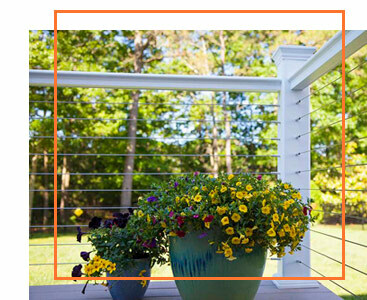 Whether you want an easy-to-install deck rail like Titan Pro Rail System or want to show off your home-improvement skills by adding cable deck railing to your RDI Transform rail, Deck Expressions has what you need. We have been offering RDI deck supplies online for years and have made the deck-building process easier by delivering everything you need right to your door. We have an amazing support team ready to answer any questions you may have about your RDI Railing supplies, and are more than happy to help in any way we can. With free shipping over $99, buying deck building materials online has never been easier or more economical. 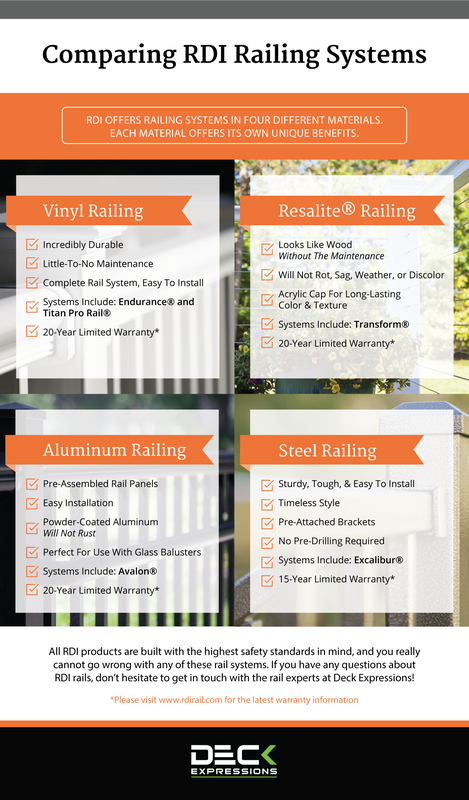 Whether you’re building a deck from scratch or updating the railing, want to line a path with beautiful railing, or need safe and secure railing for an upstairs balcony, RDI is a great choice. Of course, you will always want to check with your local building codes and regulations, but for the most part RDI makes it a point to meet or exceed all standard safety requirements for their products. Deck Expressions is happy to offer RDI products to those looking to improve appearance of their home or commercial building. Please do not hesitate to get in touch with us via phone or through our email contact form if you have any questions about your RDI Railing products. If you are a contractor, we want to be the railing supplier you can count on to make your clients happy. Our professional contractor program offers contractors a way to build long-term success by giving them access to hundreds of the newest and best decking and railing materials on the market. With our program, you will be treated as a partner — and as is true for all good business endeavors, we succeed when our partners succeed. We offer industry-leading training programs and sales/marketing and business-building tools to help you gain the professional credentials you need to stand out in this competitive industry. We will also help connect you with homeowners looking for trustworthy, knowledgeable contractors. When you sign up, you will get a 5% discount on all products from Deck Expressions. You will also gain access to free shipping on all orders, samples, and marketing materials, as well as access to the RDI Pro Partnership Program. You can learn more about that on our Contractor Program page! We look forward to partnering with you!